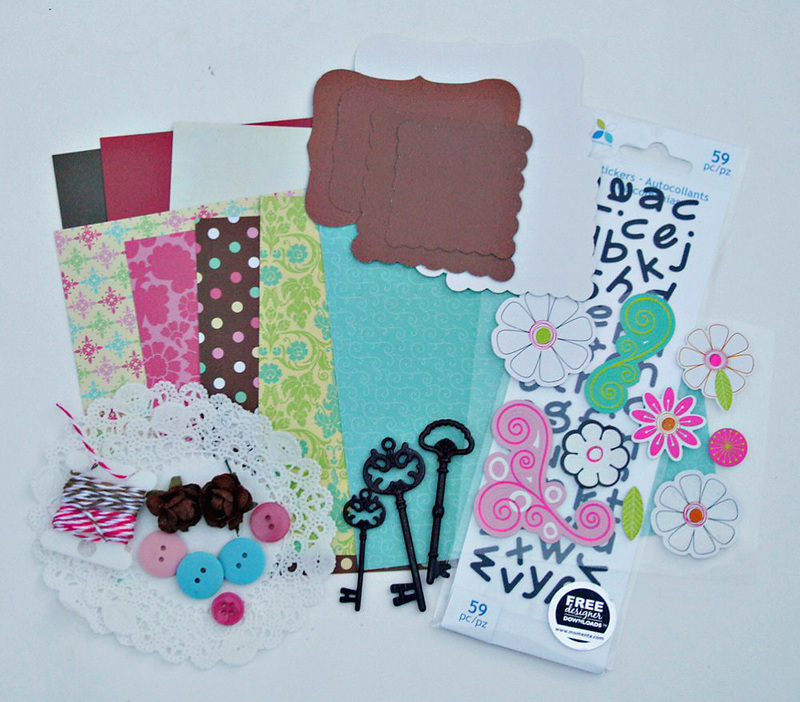 There is a ton of Momenta product in this kit along with some doilies, flowers, twine, and labels I cut on my Cricut. I know, it's not holiday themed in the least. But I thought it would be a nice change from holiday product and I was thinking the girls could make some great thank you cards if they wanted to! Here is my first card. 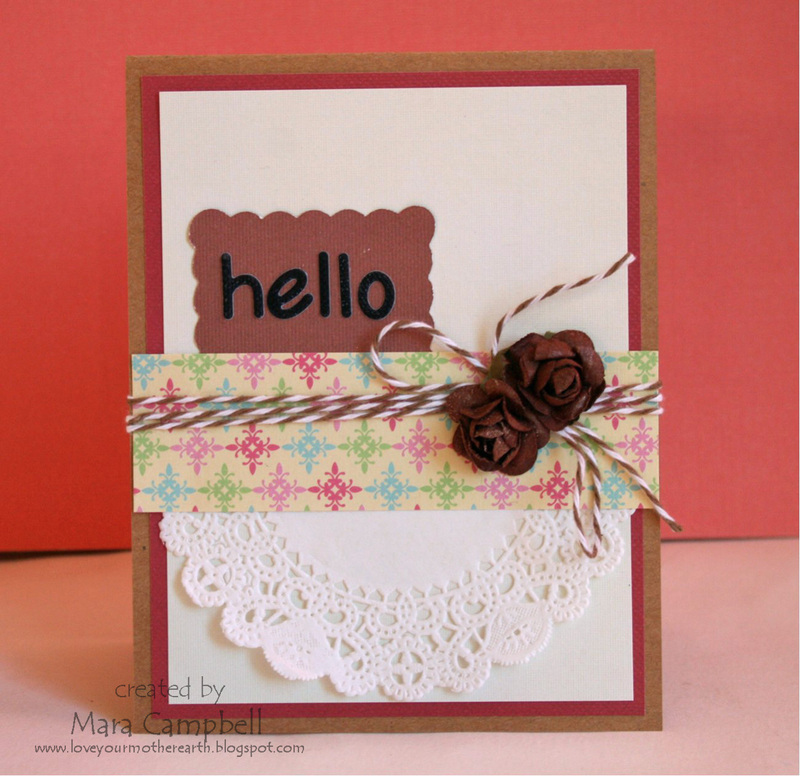 It's based on a sketch in the latest Paper Craft magazine. I loved the slanted design! 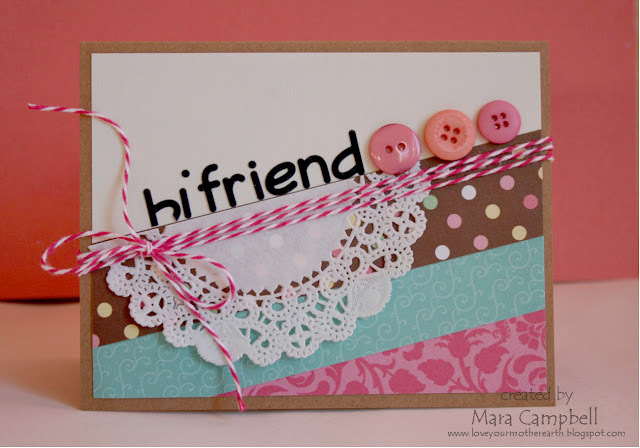 And I needed to use up the other half of that doily, so I made this card. And Paper Crafts had another sketch in their latest edition, so I used that one as well. This gave me a chance to use those fun metal keys. Here are the blogs of the other girls in the card kit...please check out what they created! Thanks for stopping by! I hope you are almost all ready for the holiday!! Please meet Chico. We got him from a local animal shelter and he has been keeping me busy around here. He's very loveable and cuddly but also pretty crazy and wild. We now have him crate trained at night but we are still dealing with other issues. He definitely keeps us on our toes! I did have a chance to make a new holiday recipe. It is very easy and you don't even need to turn on the oven. 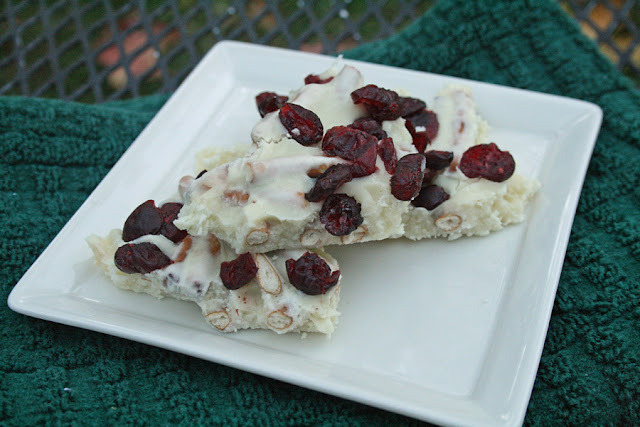 If you can use a microwave, you can make this Cranberry Crunch Bark. 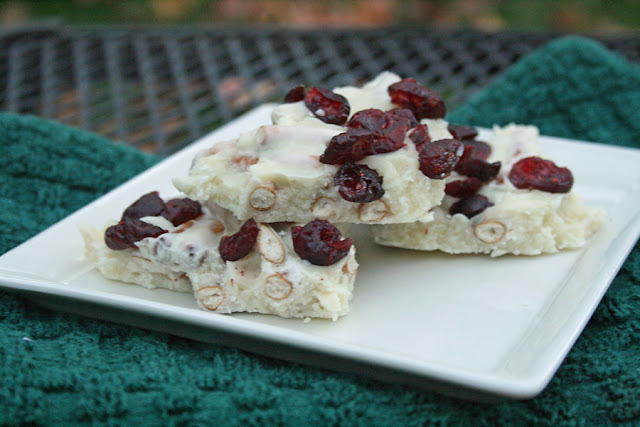 White chocolate, pretzels, and dried cranberries are a great salty and sweet combination in this treat! It felt good to be back in the kitchen. It's been far too long since I've baked any goodies. This is not really a 'recipe', but here is what you need to make it. -Line a cookie sheet with aluminum foil. -Break up the pretzel sticks into small pieces. I used about 1 1/2 cups of pretzels. -Melt the 2 bags of white chocolate chips in the microwave, stirring frequently. -When the chocolate is melted, stir in the pretzel sticks. -Pour the melted chocolate/pretzel combo on the cookie sheet. -Press in cranberries. I used an entire bag (from Target). Let cool. This would made a great addition to a cookie platter this holiday season. It comes together quickly and you don't have to turn on the oven. It's a great recipe when you don't have much time to spend in the kitchen. Or if you are running to keep your dog from digging through the trash.